Endomycorrhiza – Institut für Pflanzenkultur e.K. 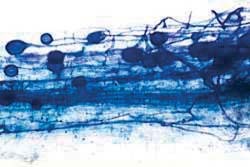 Arbuscular mycorrhiza fungi form a symbiosis with more than 90% of all plant species. Phosphates of low solubility are made available to the plants which then often show increased growth, blooming and tolerance against pathogens. The survival rate in garden- and land-scaping is higher. Additional information about our mycorrhiza products is available on the website of our sales company INOQ GmbH.